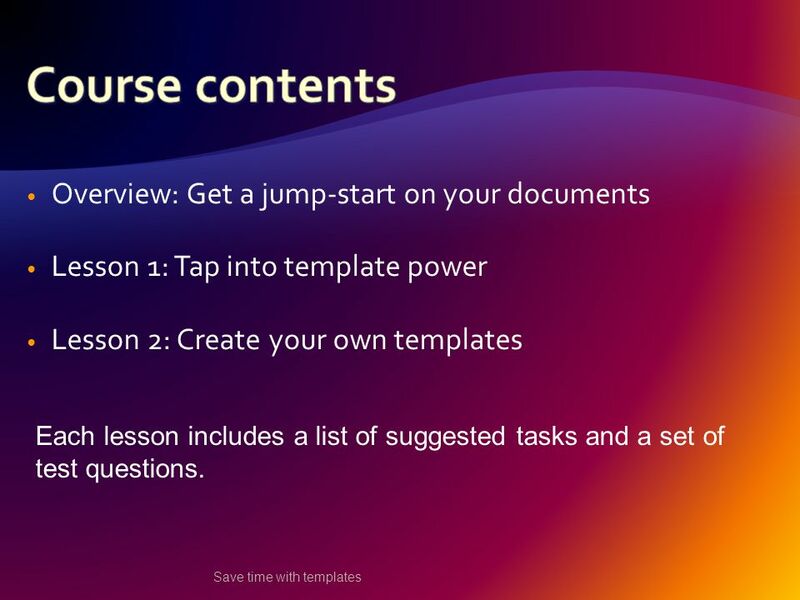 2 Overview: Get a jump-start on your documents Lesson 1: Tap into template power Lesson 2: Create your own templates Save time with templates Each lesson includes a list of suggested tasks and a set of test questions. 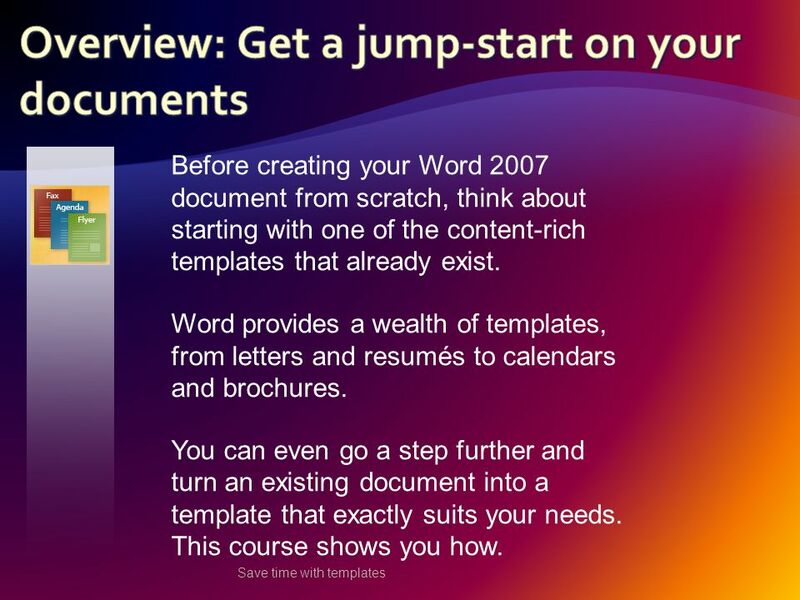 3 Save time with templates Before creating your Word 2007 document from scratch, think about starting with one of the content-rich templates that already exist. 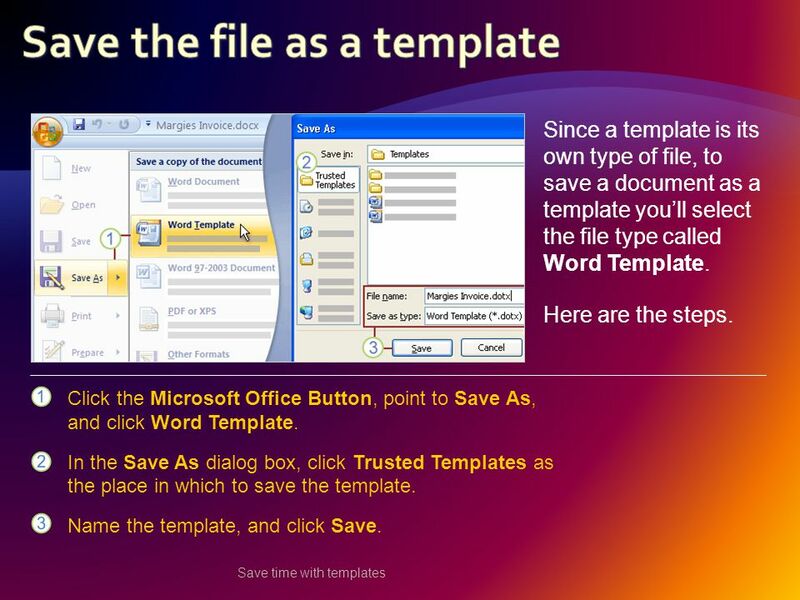 Word provides a wealth of templates, from letters and resumés to calendars and brochures. 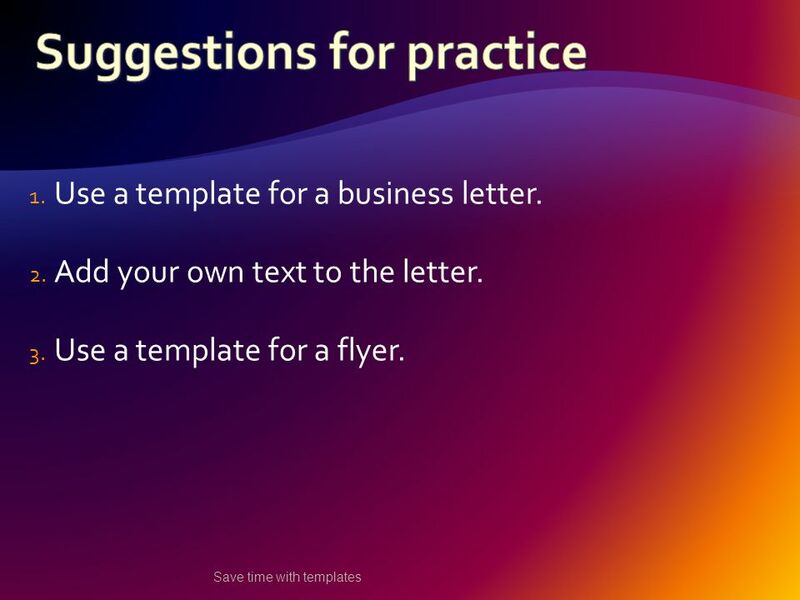 You can even go a step further and turn an existing document into a template that exactly suits your needs. This course shows you how. 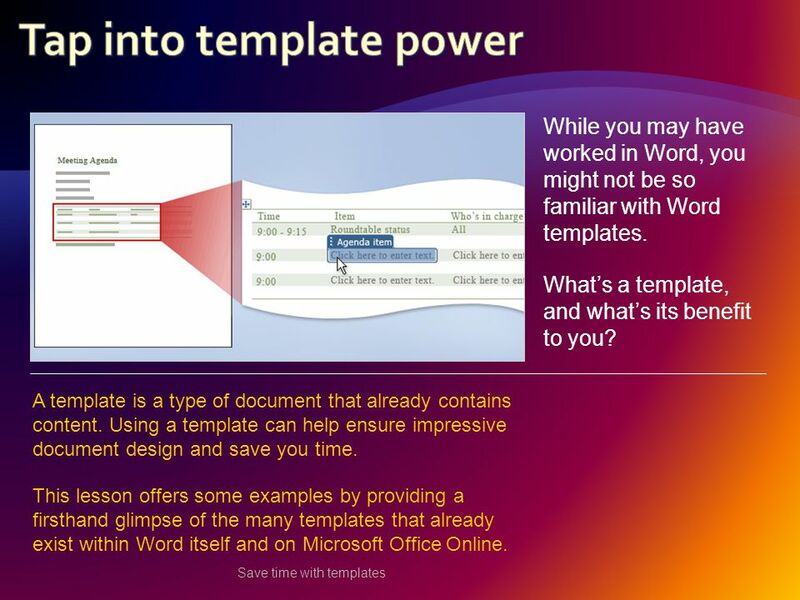 6 Save time with templates While you may have worked in Word, you might not be so familiar with Word templates. What’s a template, and what’s its benefit to you? A template is a type of document that already contains content. Using a template can help ensure impressive document design and save you time. 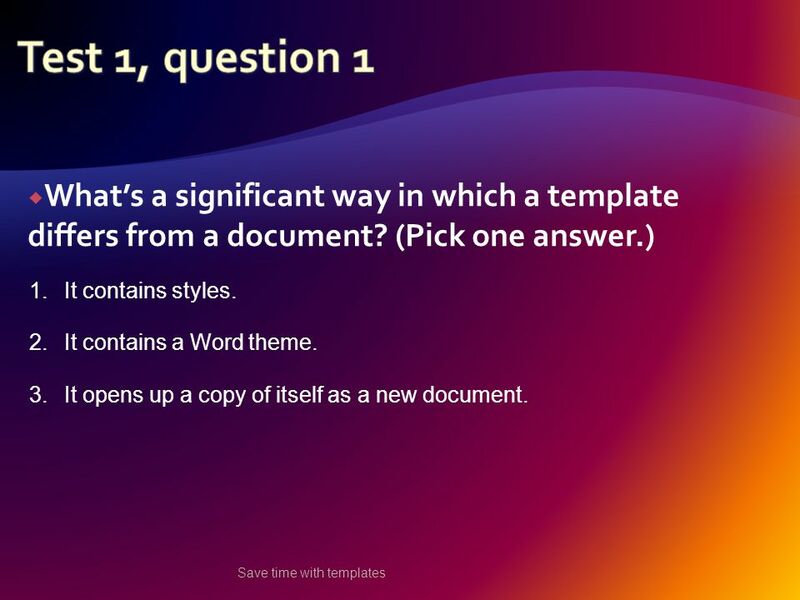 This lesson offers some examples by providing a firsthand glimpse of the many templates that already exist within Word itself and on Microsoft Office Online. 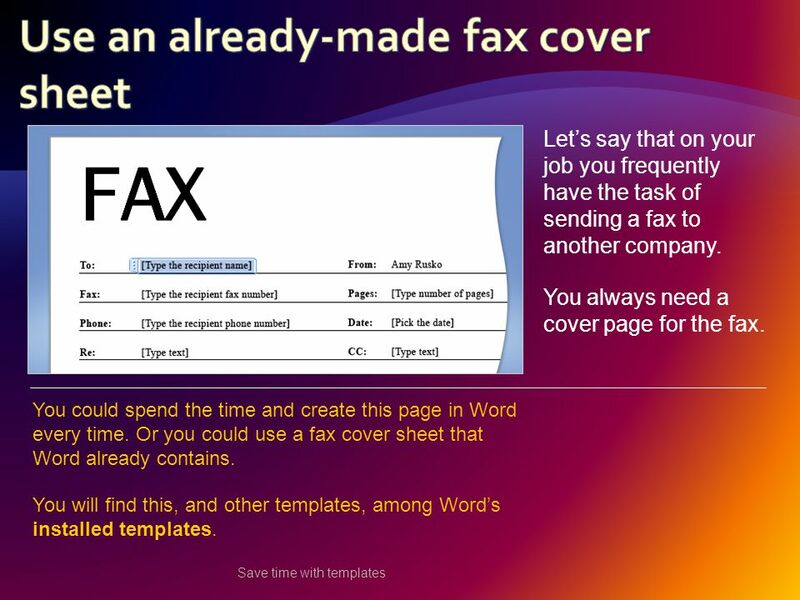 7 Save time with templates Let’s say that on your job you frequently have the task of sending a fax to another company. You always need a cover page for the fax. You could spend the time and create this page in Word every time. Or you could use a fax cover sheet that Word already contains. You will find this, and other templates, among Word’s installed templates. 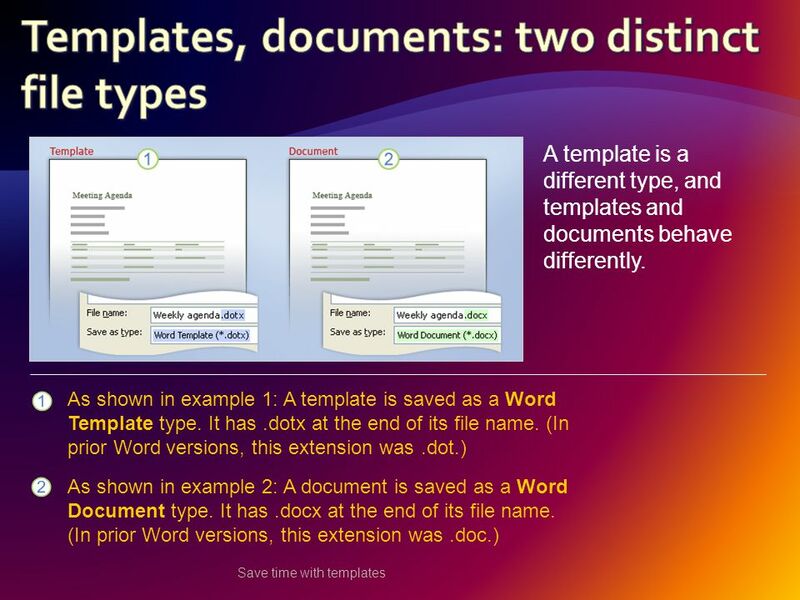 8 Save time with templates Here’s another example of how Word templates could help you. Imagine that you’re in charge of creating the agenda for your weekly team meeting. 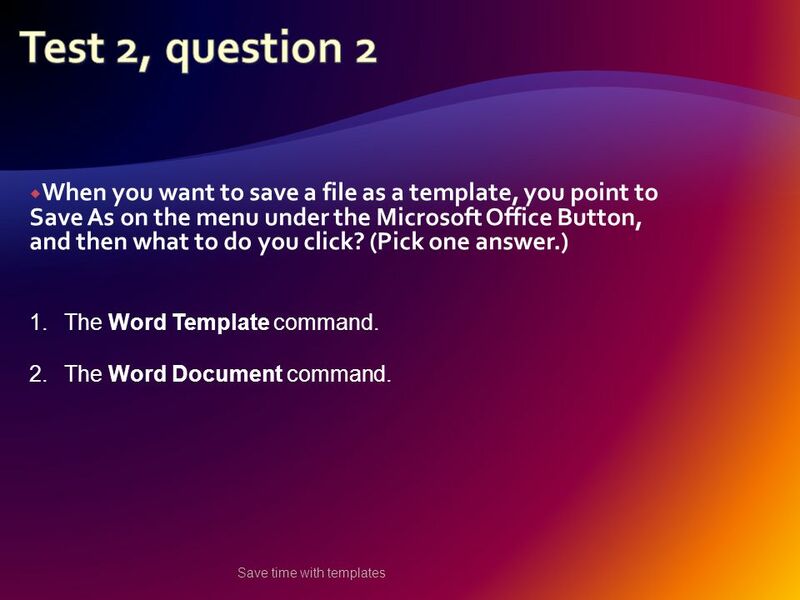 Before you start from a blank page, look at the templates available on Microsoft Office Online—you can link directly to these from within Word. 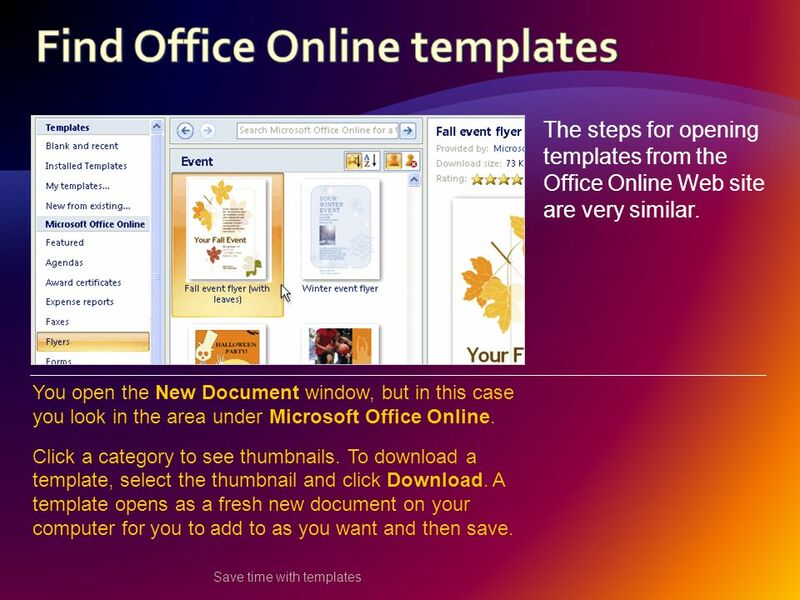 On Office Online, you’ll find a vast and varied collection of templates organized into categories. Within each, you have several choices of template type. 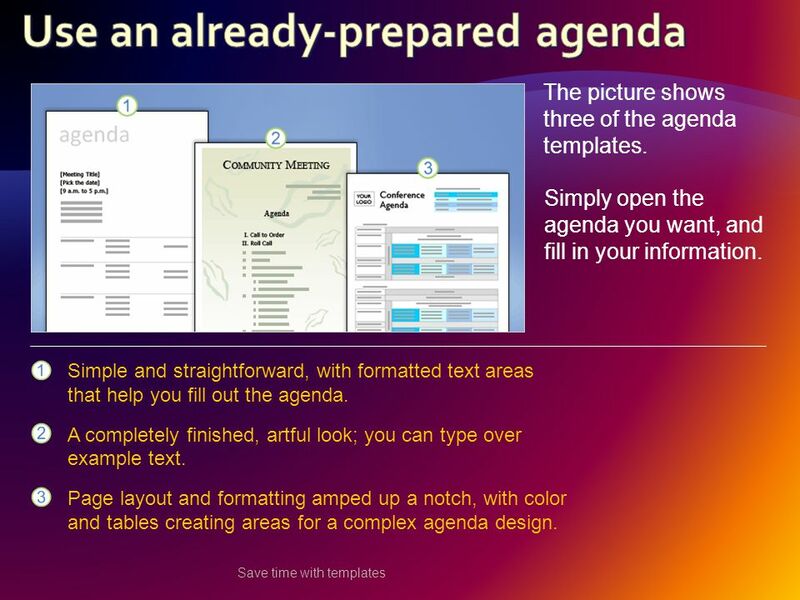 9 Save time with templates The picture shows three of the agenda templates. 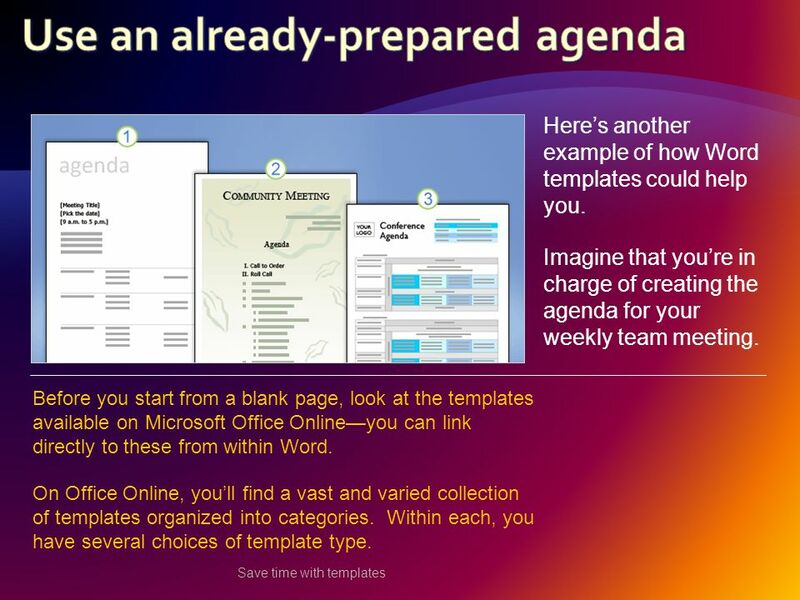 Simple and straightforward, with formatted text areas that help you fill out the agenda. A completely finished, artful look; you can type over example text. Page layout and formatting amped up a notch, with color and tables creating areas for a complex agenda design. Simply open the agenda you want, and fill in your information. 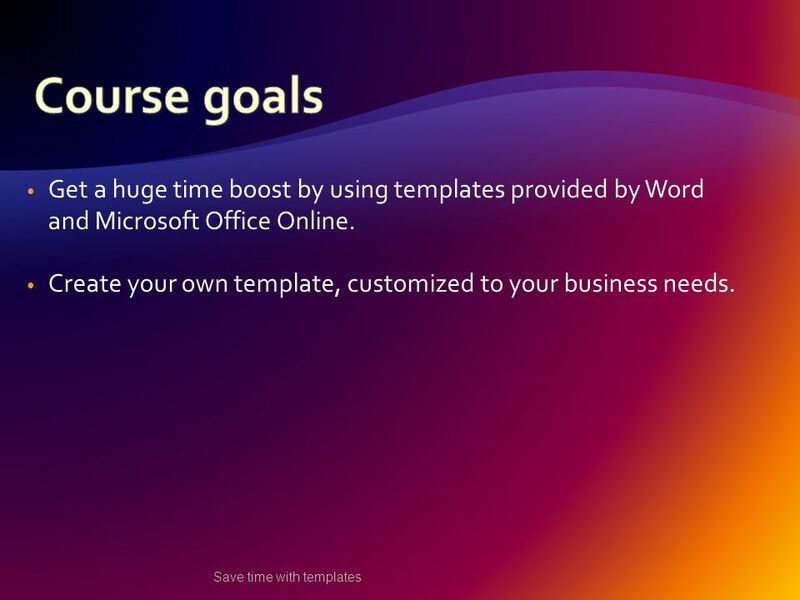 10 Save time with templates Word includes over 30 pre-installed templates for document types such as letters, faxes, reports, resumés, and blog posts. Here’s how you find them. Click the Microsoft Office Button, and click New. In the New Document window, click Installed Templates. 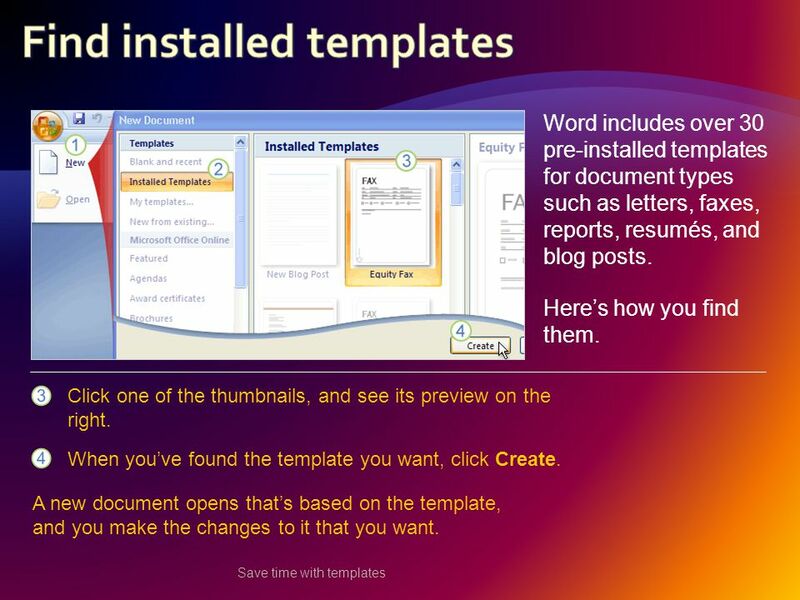 11 Save time with templates Word includes over 30 pre-installed templates for document types such as letters, faxes, reports, resumés, and blog posts. Here’s how you find them. Click one of the thumbnails, and see its preview on the right. 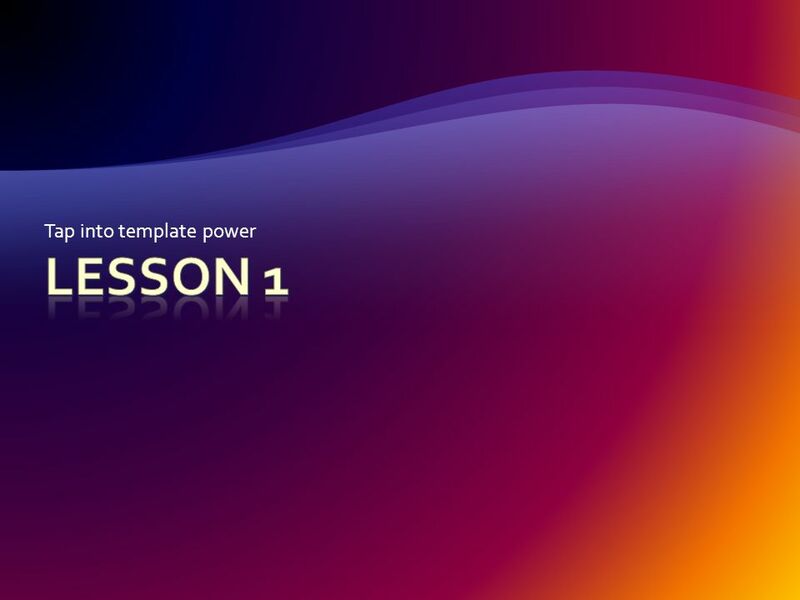 When you’ve found the template you want, click Create. A new document opens that’s based on the template, and you make the changes to it that you want. 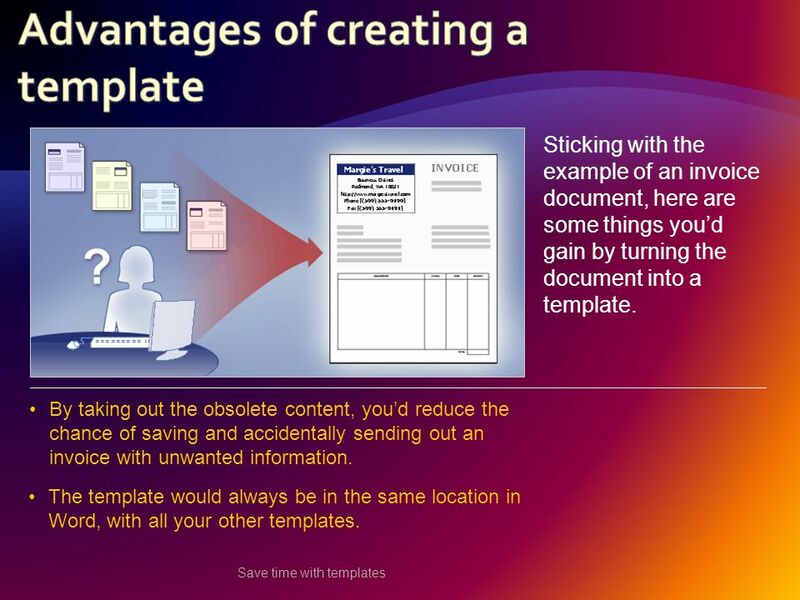 12 Save time with templates The steps for opening templates from the Office Online Web site are very similar. You open the New Document window, but in this case you look in the area under Microsoft Office Online. Click a category to see thumbnails. 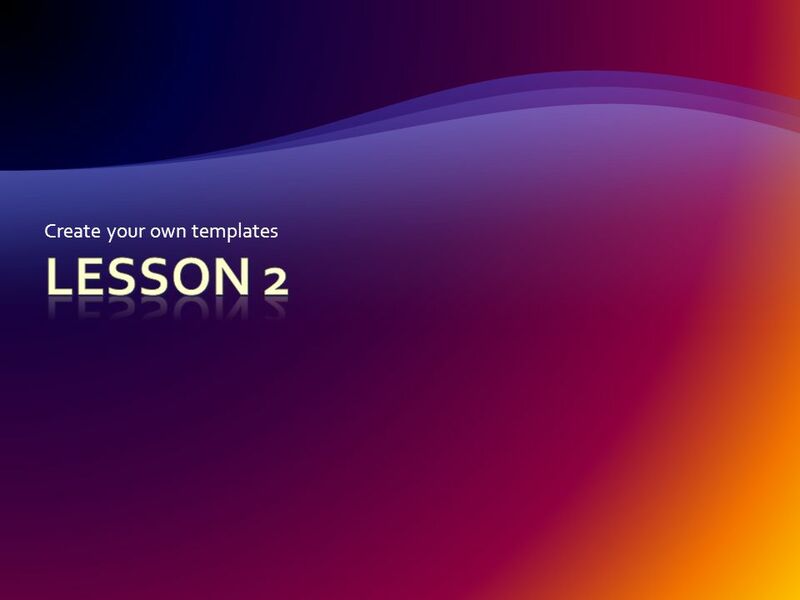 To download a template, select the thumbnail and click Download. 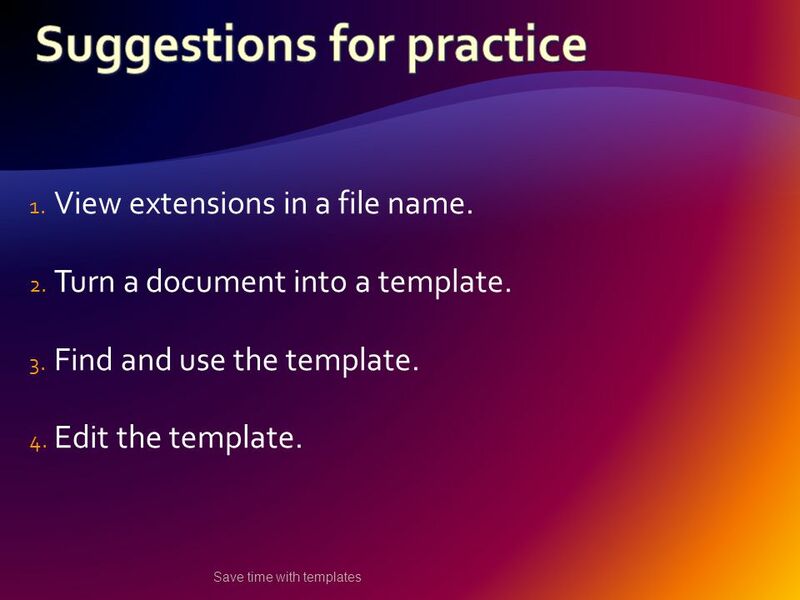 A template opens as a fresh new document on your computer for you to add to as you want and then save. 13 Save time with templates When you open a template, a new document opens that’s based on the template you selected. 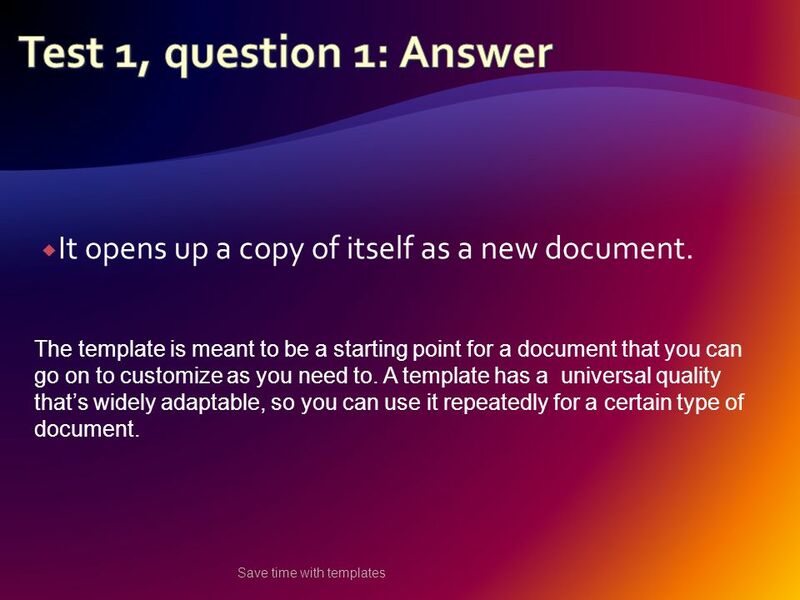 So you’re opening a copy of the template, not the template itself. 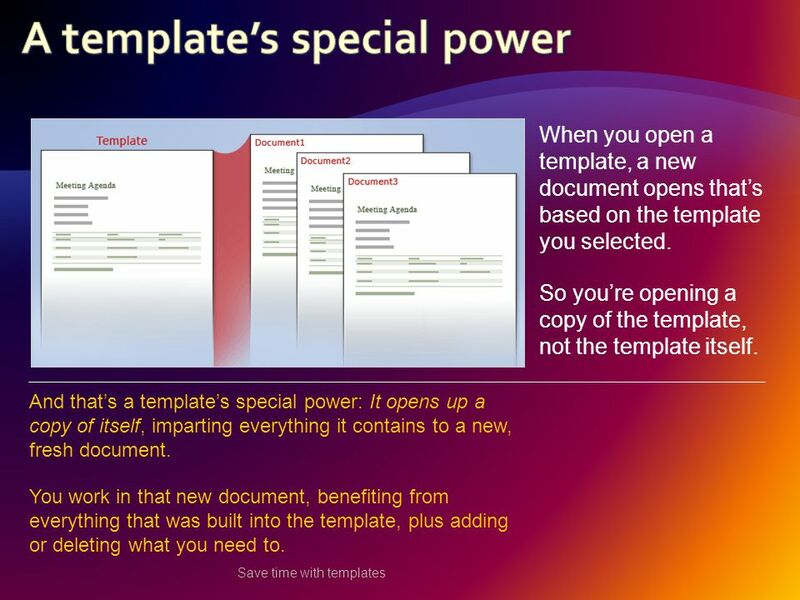 And that’s a template’s special power: It opens up a copy of itself, imparting everything it contains to a new, fresh document. You work in that new document, benefiting from everything that was built into the template, plus adding or deleting what you need to. 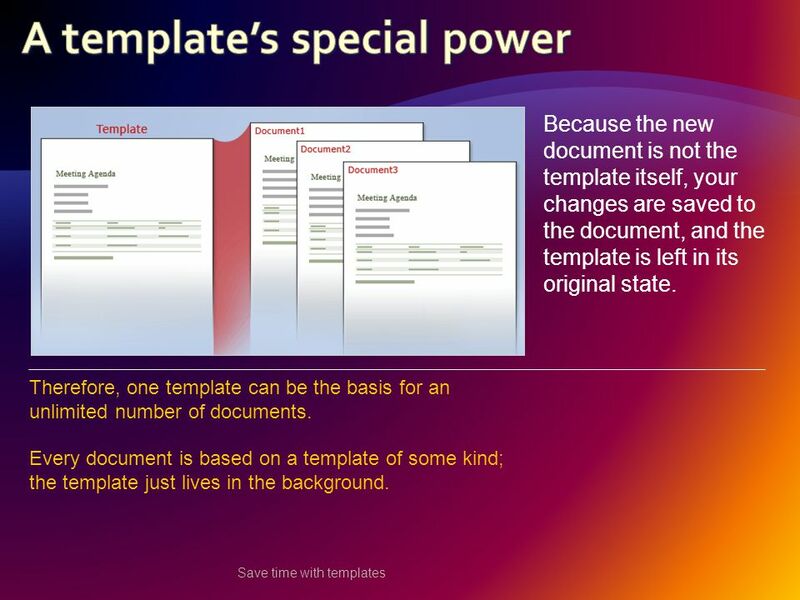 14 Save time with templates Because the new document is not the template itself, your changes are saved to the document, and the template is left in its original state. Therefore, one template can be the basis for an unlimited number of documents. Every document is based on a template of some kind; the template just lives in the background. 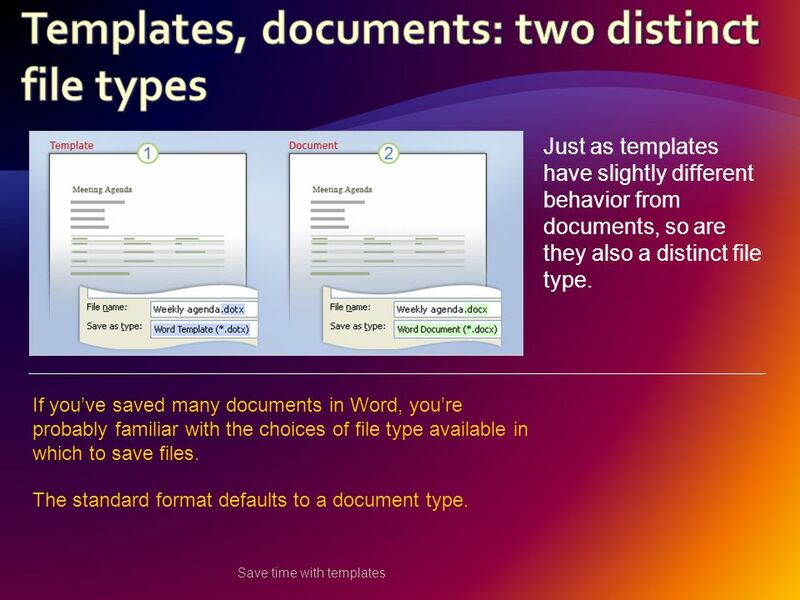 15 Save time with templates Just as templates have slightly different behavior from documents, so are they also a distinct file type. If you’ve saved many documents in Word, you’re probably familiar with the choices of file type available in which to save files. The standard format defaults to a document type. 18  What’s a significant way in which a template differs from a document? (Pick one answer.) Save time with templates 1.It contains styles. 2.It contains a Word theme. 3.It opens up a copy of itself as a new document. 19  It opens up a copy of itself as a new document. 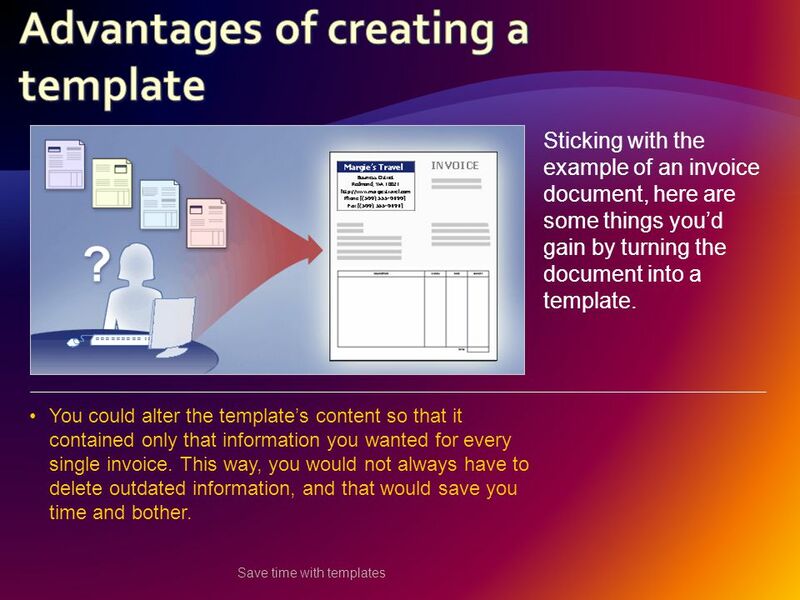 Save time with templates The template is meant to be a starting point for a document that you can go on to customize as you need to. A template has a universal quality that’s widely adaptable, so you can use it repeatedly for a certain type of document. 20  Within Word, what’s the first step to finding existing Word templates? (Pick one answer.) Save time with templates 1.Click the Microsoft Office Button, and then click New. 2.Click the Microsoft Office Button, and the click Word Options. 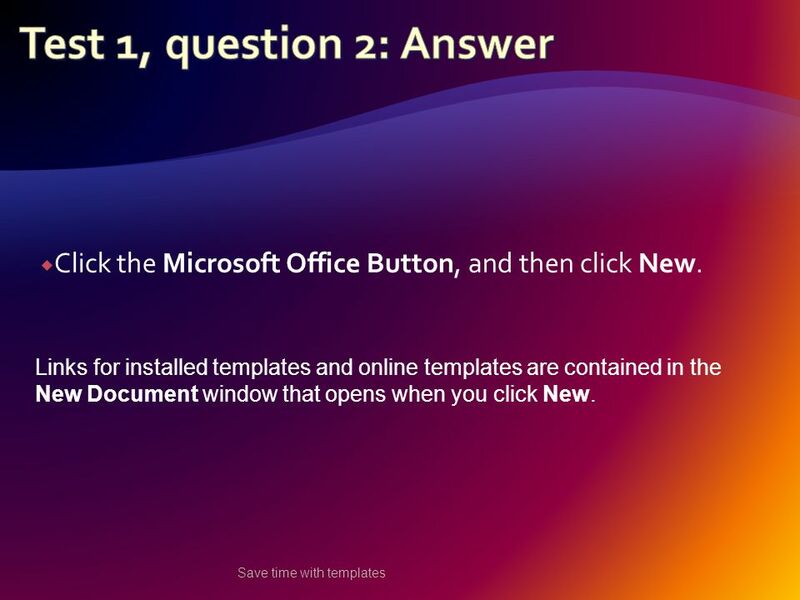 21  Click the Microsoft Office Button, and then click New. Save time with templates Links for installed templates and online templates are contained in the New Document window that opens when you click New. 22  A template is different from a document in the way that it behaves and also as a file type. (Pick one answer.) Save time with templates 1.True. 2.False. 23  True. Save time with templates A template differs from a document in that it opens up a copy of itself in the form of a fresh, new document. Also, it is saved as a file type called Word Template, which has the.dotx extension at the end of the file name. 25 Save time with templates Say you often use a certain invoice whose basic content stays the same except for certain details that change each time. In effect, you’re using your original document as a template, although you may never have turned it into one. Why not do so? You’ll have one clear master to work from, and you won’t have to undo outdated content when you’re preparing a current invoice. 26 Save time with templates Sticking with the example of an invoice document, here are some things you’d gain by turning the document into a template. You wouldn’t have to search through various document versions; changes would all be stored in the template. Since a template opens up a copy of itself, you wouldn’t have to worry about accidentally saving over one of your previous invoices. 27 Save time with templates Sticking with the example of an invoice document, here are some things you’d gain by turning the document into a template. 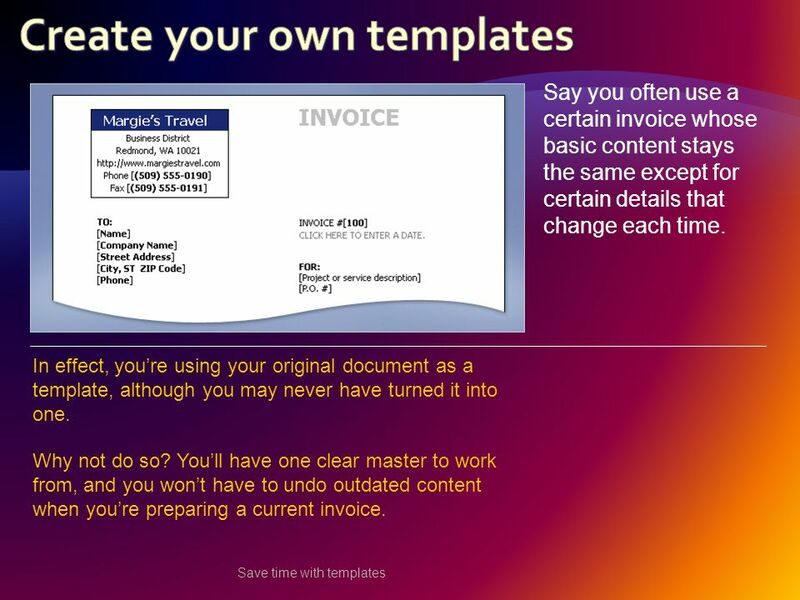 You could alter the template’s content so that it contained only that information you wanted for every single invoice. This way, you would not always have to delete outdated information, and that would save you time and bother. 28 Save time with templates Sticking with the example of an invoice document, here are some things you’d gain by turning the document into a template. By taking out the obsolete content, you’d reduce the chance of saving and accidentally sending out an invoice with unwanted information. The template would always be in the same location in Word, with all your other templates. 29 Save time with templates Part of the process of creating a template is leaving or creating just the information in it that you want. This is the content that you’d want each new document that was based on the template to start with. Much of what you put in the template depends on your own preferences and the particulars of the content. 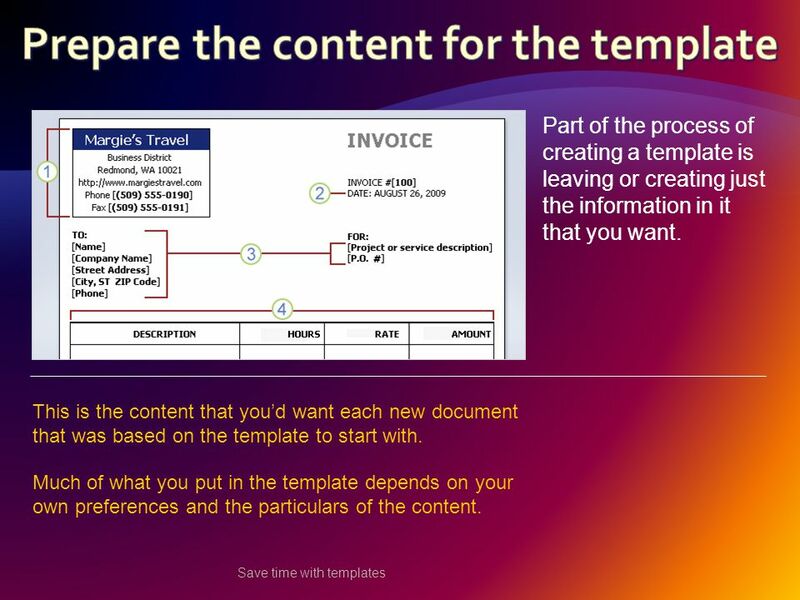 31 Save time with templates First, open the document you want to use to create the template (in this case, the invoice document), or open a blank document. Leave text placeholder areas for information that will change per invoice: company name and address the invoice goes to. Here are typical things you might do afterward: Leave empty the areas that will change for every invoice: work done, number of hours, and total cost. 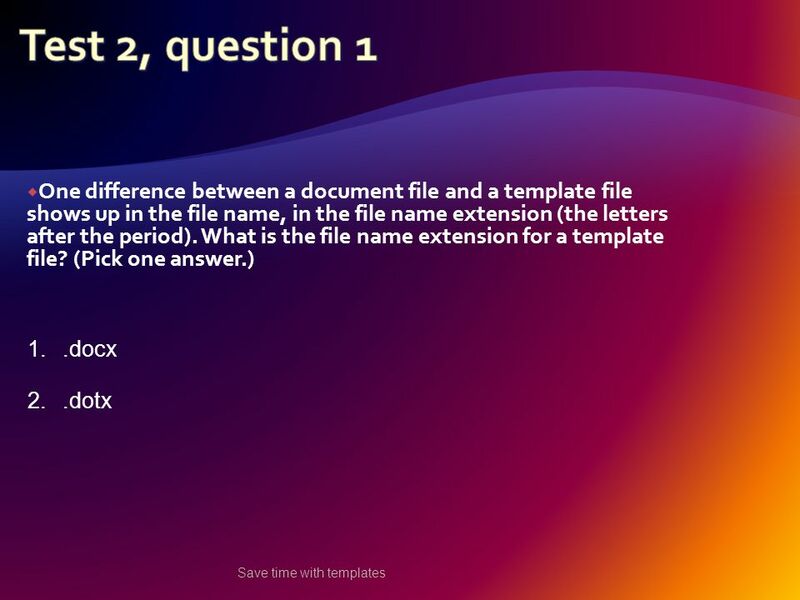 32 Save time with templates Since a template is its own type of file, to save a document as a template you’ll select the file type called Word Template. Here are the steps. 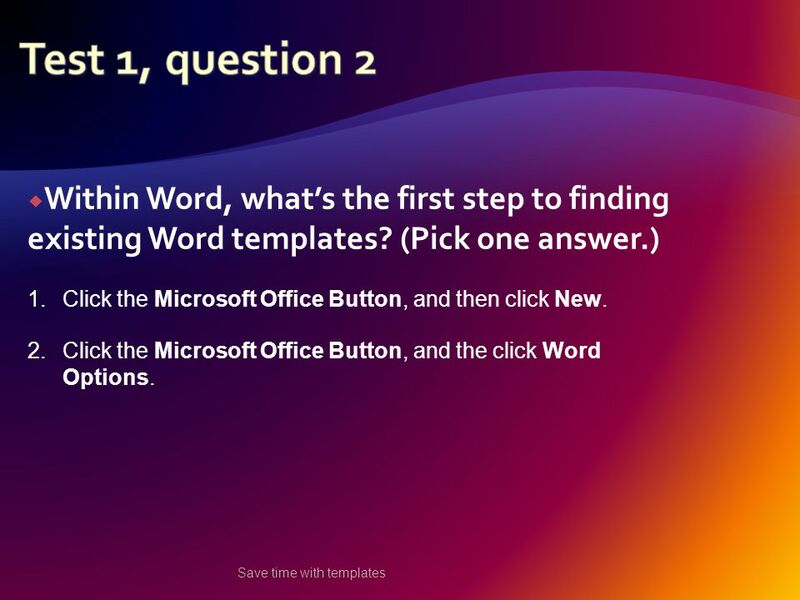 Click the Microsoft Office Button, point to Save As, and click Word Template. In the Save As dialog box, click Trusted Templates as the place in which to save the template. Name the template, and click Save. 33 Save time with templates Putting the template in Trusted Templates is important. Because macros can contain malicious code, Word is on the lookout against opening documents with macros. If your computer security settings are at the recommended level, Word will open any template file, but it will disable any macros it contains. This tells Word that it’s safe to open even if the template should contain macros or other code. 34 Save time with templates Putting the template in Trusted Templates is important. This tells Word that it’s safe to open even if the template should contain macros or other code. 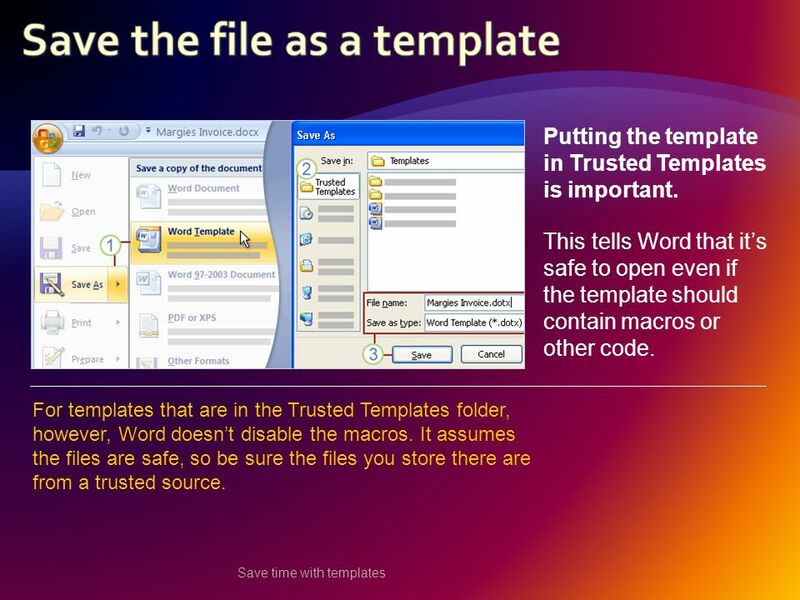 For templates that are in the Trusted Templates folder, however, Word doesn’t disable the macros. It assumes the files are safe, so be sure the files you store there are from a trusted source. 35 Save time with templates Another advantage of saving a template in the Trusted Templates folder is that Word then makes it very easy to find. In the New Document window, click My templates. Click the template you want. 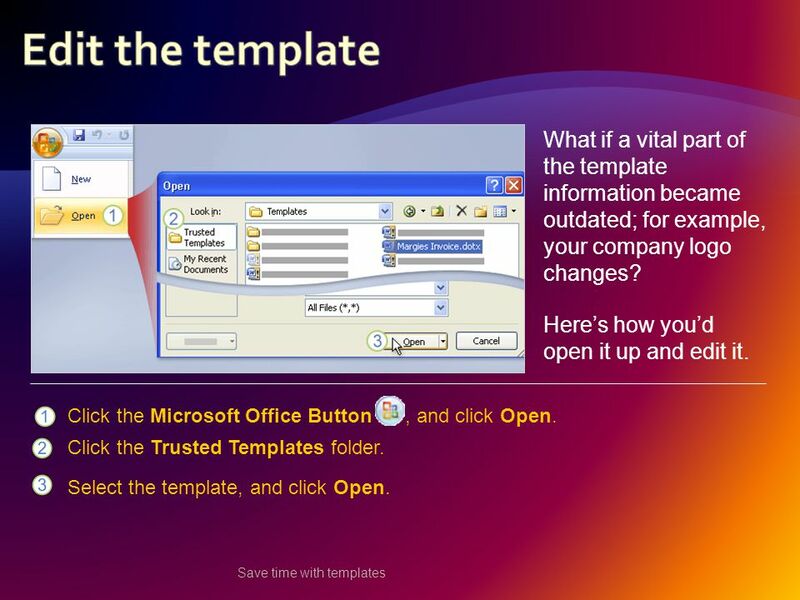 Make sure that Document is selected on the lower right, under Create New, and then click OK.
36 Save time with templates What if a vital part of the template information became outdated; for example, your company logo changes? Here’s how you’d open it up and edit it. Click the Microsoft Office Button, and click Open. 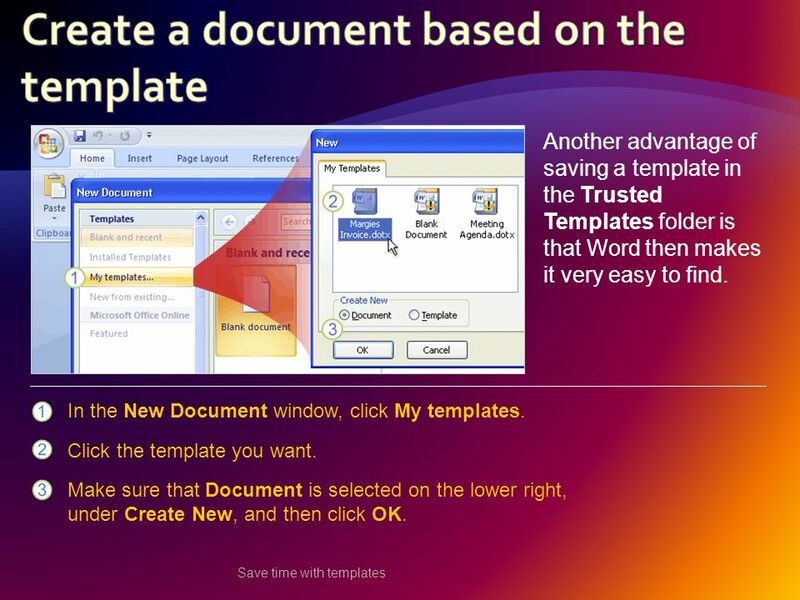 Click the Trusted Templates folder. Select the template, and click Open. 37 Save time with templates What if a vital part of the template information became outdated, for example, your company logo changes? Here’s how you’d open it up and edit it. 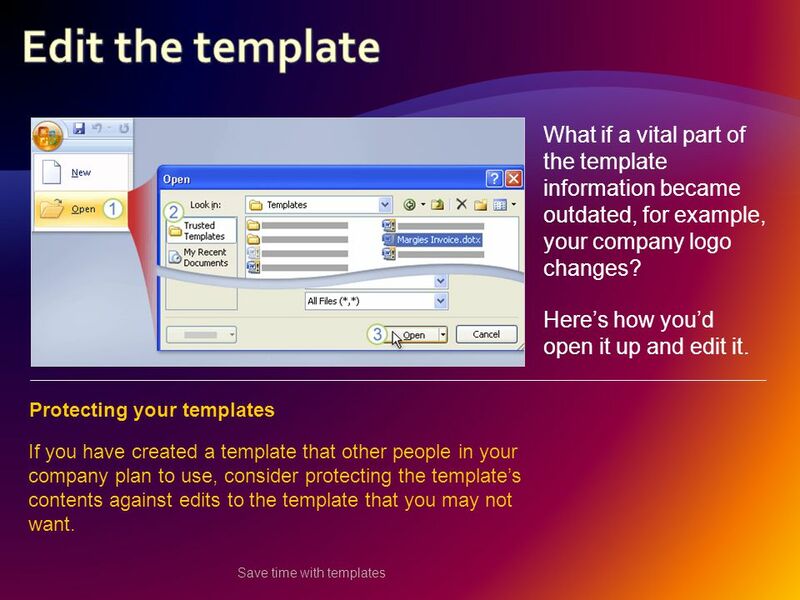 Protecting your templates If you have created a template that other people in your company plan to use, consider protecting the template’s contents against edits to the template that you may not want. 40 .dotx. 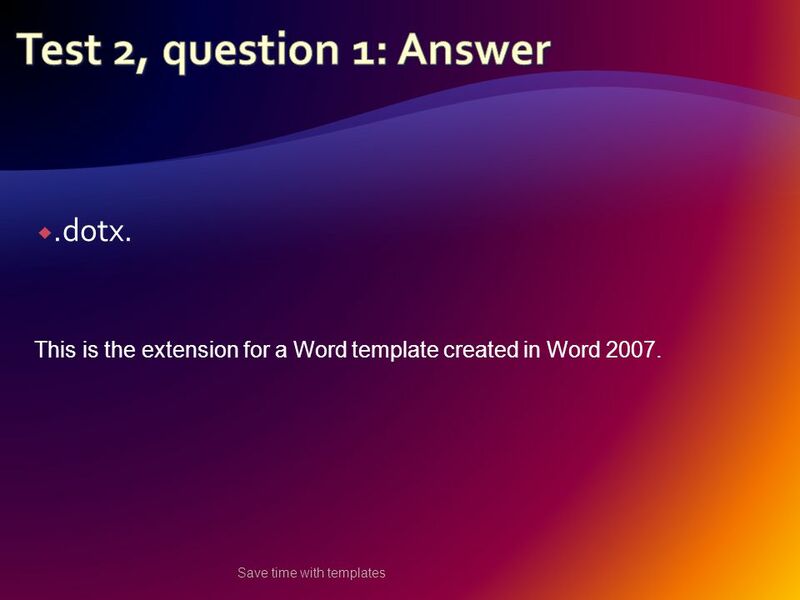 Save time with templates This is the extension for a Word template created in Word 2007. 41  When you want to save a file as a template, you point to Save As on the menu under the Microsoft Office Button, and then what to do you click? (Pick one answer.) 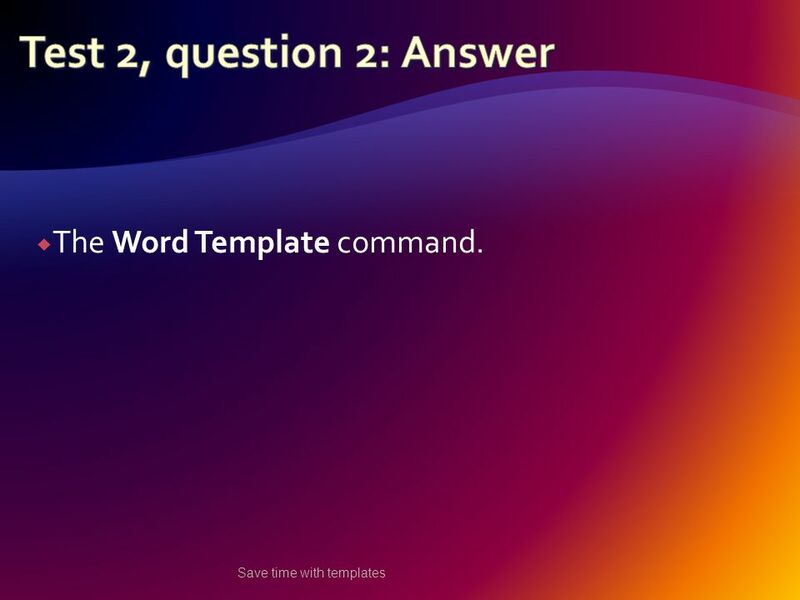 Save time with templates 1.The Word Template command. 2.The Word Document command. 43  What’s one reason you should save a template in the Trusted Templates folder? (Pick one answer.) Save time with templates 1.So that you can find it using the My Templates link in the New Document window. 2.This protects the template from being edited by someone else. 44 Save time with templates  So that you can find it using the My Templates link in the New Document window. This is a great reason. Just as important, this tells Microsoft Word it does not have to disable macros, if the template contains them, when it opens the template. For this reason, be sure you can fully trust any template that you put in this folder. 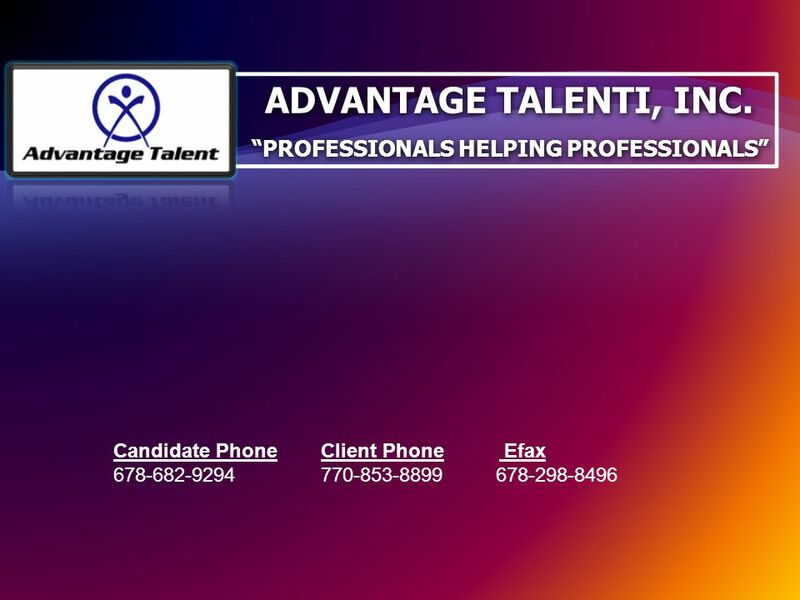 Download ppt "Save time with templates Candidate Phone Client Phone Efax 678-682-9294 770-853-8899 678-298-8496 ADVANTAGE TALENTI, INC. “PROFESSIONALS HELPING PROFESSIONALS”"
Introduction to Microsoft Word 2007 Access to Microsoft Word 2007 differs greatly from versions that preceded it, mostly in the way functions across the. Microsoft Office 2007 Microsoft ® Office 2007 Training Get up to speed with the 2007 system. 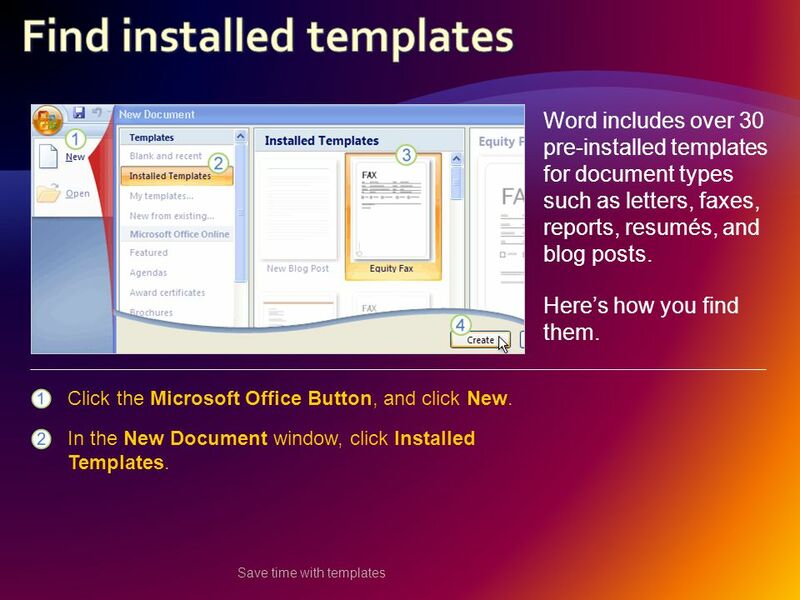 Microsoft ® Office Word 2007 Training Table of Contents III: Use fields to create a TOC and create multiple TOCs Neeginan Institute of Applied Technology. 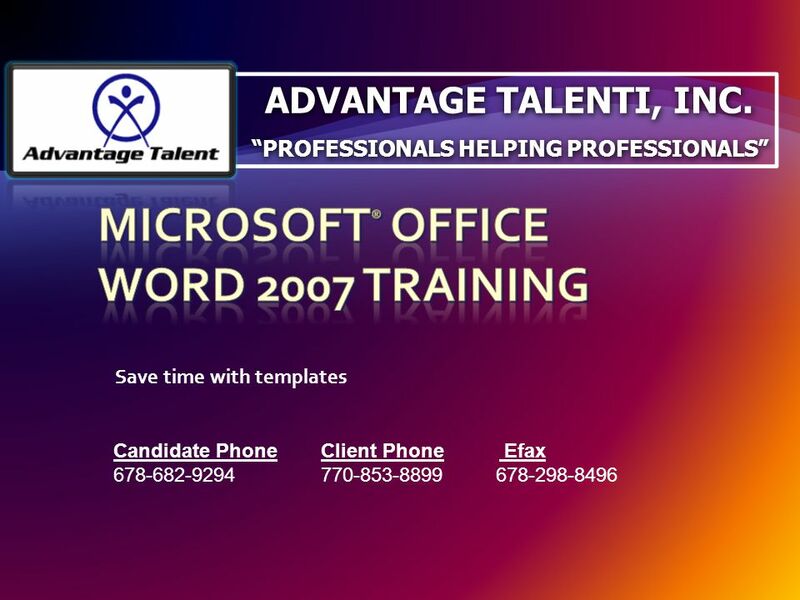 Microsoft ® Office Outlook ® 2007 Training Retrieve, back up, or share messages ADVANTAGE TALENT, INC. “Professionals Helping Professionals” Candidate. Access 2007 ® Use Databases How can Microsoft Access 2007 help you to get and stay organized?